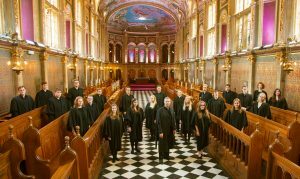 The Bristol Ensemble is joined by the Choir of Royal Holloway to perform a compelling programme of choral music ranging from Vaughan Williams’ iconic Serenade to Music to contemporary works by Cecilia McDowall, Tõnu Kõrvits and Ēriks Ešenvalds. Please note that the programme has changed from what was previously advertised. Tickets are also available from Opus 13 music shop, by telephone on 0117 923 0164, and from the shop at St Michael’s Hill, Bristol. Card payments accepted. The shop is open from 9am to 5.30pm, Monday to Saturday. Tickets are also on sale at Henleaze Post Office.